للمسافرين الذين يرغبون أن يعيشو كل ما تقدمه وادى باروسا, Wroxton Grange B&B هو الخيار الأمثل. يمكن من هنا للضيوف الاستمتاع بسهولة الوصول إلى كل ما تقدمه هذه المدينة النابضة بالحياة. كما يمكن الوصول بسهولة إلى Menglers Hill Lookout, سوق باروسا للمزارعين, نيفيل ج سميث - مركز الألعاب الرياضية. يقدم Wroxton Grange B&B خدمات لا غبار عليها وكل أشكال اللياقة وحسن الضيافة اللازمة لإسعاد ضيوفه. يمكن لضيوف الفندق الاستمتاع بالميزات التالية على أرض الفندق: صف السيارات, غرفة عائلية, جولات . ادخل إلى واحدة من الغرف 1 وتخلص من عناء نهار طويل بمساعدة مجموعة كبيرة من الخدمات كمثل غرف لغير المدخنين, مكيف هواء, شرفة/ تراس, تلفزيون, مشغل أقراص DVD/CD الموجودة في بعض الغرف. يقدم الفندق خدمات رائعة كمثل حديقة لمساعدتك على الاسترخاء بعد نهار طويل من النشاط والتجوال في المدينة. استمتع بخدمات لا يعلى عليها وعنوان ذو اعتبار في Wroxton Grange B&B . 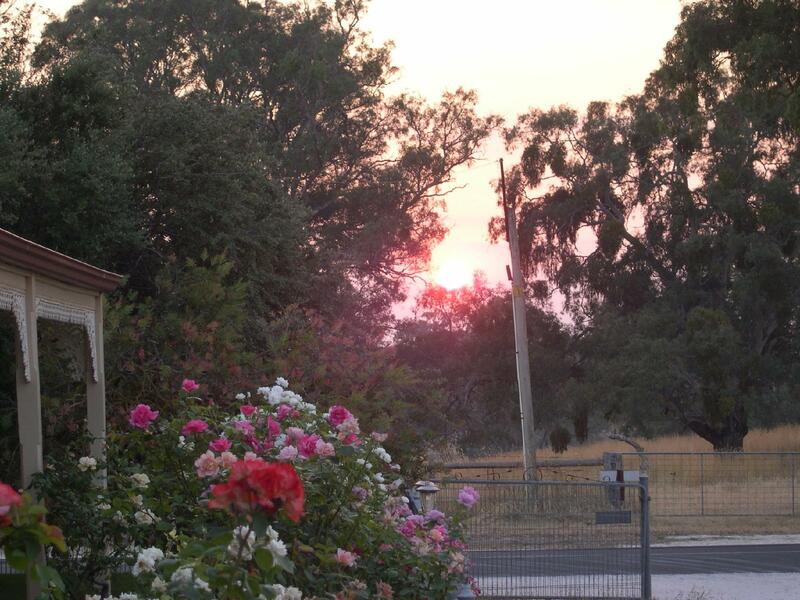 We had a very pleasant stay overnight in clean, comfortable facilities in a lovely old home on a tidy working farm and vineyard, in a quiet rural setting with wonderful old gum trees and birds in the garden that we had not seen before. So much nicer than a motel. We enjoyed a walk to the dam , slept well and relaxed on the front verandah. A kangaroo hopped by in the morning and we heard a kookaburra. Charming. Unfortunately my wife and I only had 1 night at this quaint B&B. Located on a vineyard and inside a beautiful country home. Well located with only a 5-10 minute drive to the local town that has a selection of eateries. Jo was a very accommodating host and provided excellent breakfast supplies for us to enjoy in the morning. Would recommend this B&B looking for something quiet, quaint & relaxing. Comfy beds, good food, decor was great and gave you a real homely feel. I cold and univiting, 2 dogs greet the cars barking incessantly nodoby around. TV very small and hard to hear. I sorry I prepaid l.
Very good quiet place for a weekend. Easily accessible to the wineries. Warm country welcome from our hosts. We had plenty of space as there was lounge room as well as bedroom bathroom and kitchen. Not at all what I expected,more old than quaint and I expected bacon at least with the breakfast provisions as the area is renown for its German smoked bacon.I have stayed at numerous B&B's and must say I was disappointed and couldn't recommend it to anyone with any sincerity. We extremely enjoyed our stay at the Wroxton Grange B&B, so peaceful and relaxing. Such friendly service, very accommodating. We would recommend this B&B to everyone. Not far from attractions. The bathroom is not ensuite, it is a small walk through a joint use room. If the other bnb room is booked people can be using the joint use room. Breakfast supplies were minimal. We were not encouraged to use the lovely sitting room displayed on website, but were shown it was there. The standard of all other rooms was very very much lower. Kitchen area made up of odd pieces of furniture, cutlery, crockery etc. Whilst appearing to be a quiet country location, we awoke to a cycling event being held straight in front of the bnb and the bedroom with hundred people and cars, much noise and excitement. This was the not the fault of the bnb but was not the way we meant to spend a Sunday morning in the country.